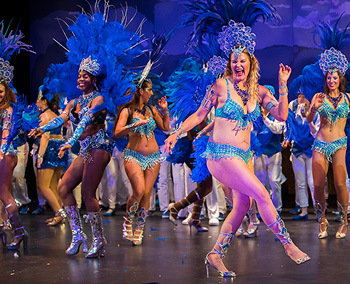 Austin Samba brings its signature Brazilian drumming and dance to the historic Paramount Theater this Carnival season with its hip-shaking 2019 show: “Carnavália.” Featuring music by Beth Carvalho, Os Tribalistas and Caetano Veloso, Carnavália is sure to get you on your feet and will be a can’t-miss part of Austin’s Carnaval and Mardi Gras season. Austin Samba is the largest samba school in the U.S. Founded in 2001, it is a volunteer-run educational and performance group of more than 40 drummers and 60 dancers that performs music and dance from across Brazil. Austin Samba performs at parades, festivals and special occasions, bringing the music, movement, color, pageantry and joy of Brazilian Carnaval to events throughout the region. Austin Samba is open to the community, offering classes to beginners every year.